Oh man, where to even begin with these two. I’d previously shot their adorable in-home engagement session, and I pretty much fell in love with them while we bonded over champagne. I knew their Palm Springs inspired wedding at Plaza del Toro would be gorgeous, but it totally blew me away! Georgia’s boho dress and Brian’s hip, red suit perfectly represented their personalities. 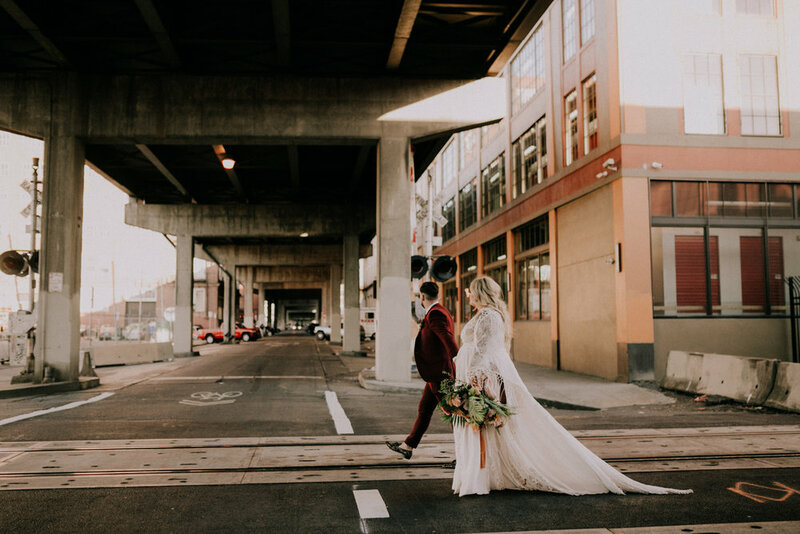 Then showing up to see an industrial restaurant venue transformed into a bohemian and classy event space was the icing on the cake. They had a small ceremony with family and close friends, and afterwards the rest of their guests arrived. There wasn’t a sit down dinner, and the whole reception felt like a hip cocktail hour turned dance party. These two did things their way, and I couldn’t have been more excited to capture it all.